Luminate Online is a tool that provides users with the tools and features they need to help them better comprehend their online supporters and enhance the performance of their online fundraising endeavors. This platform is loaded to the brim with functionalities and capabilities to engage, attract, and retain supporters, as well as plan and execute campaigns for online fundraisers. With Luminate Online, users have everything they need to grow and nurture sustainable donor relationships. Luminate Online Marketing delivers a very powerful digital fundraising and marketing automation software designed specifically for non-profitable organizations. The software is an ideal partner in accelerating their impact of their mission while helping them stand out from other non-profitable groups. With Lumninate Online Marketing, users have a powerful fundraising and marketing automation software that helps them establish their cause or advocacy and find the right people to help them propel their mission forward. The software is equipped with tools and capabilities designed to help them engage supporters and potential donors better, build and grow a relationship based on strong core values. Luminate Online helps users plan and launch dynamic email campaigns. Prior to the start of every email campaign, Luminate Online marketing enables users to address all aspects, from creation to testing, to targeted delivery and follow-up. With the dynamic email campaign functionality, users are able to send welcome series or donation upgrade campaigns as well as engagement surveys to determine what and how supporters desire to interact with your nonprofit organization and help your cause. With the A/B and beyond testing capabilities, users are able to measure and gauge the effectiveness of one campaign against another. This means users are able to identify areas where they lack and excel and use the information to further improve their email campaign strategies. 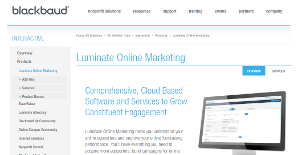 Luminate Online Marketing is also a perfect platform for planning and running online fundraisers. With the help of the Calendar Events tool, users can easily determine the perfect schedule for their events, increase event attendance, and provide supporters with various attendance options to name a few. Users can also run digital marketing campaigns as ll as a peer-to-peer fundraising events. If you are interested in Luminate Online it might also be sensible to analyze other subcategories of Best Donor Management Software collected in our base of B2B software reviews. There are well-liked and widely used systems in each software category. But are they automatically the best fit for your organization’s special wants? A trendy software product may have thousands of customers, but does it present what you need? For this reason, do not blindly invest in popular systems. Read at least a few Luminate Online reviews and think about the aspects that you want in the software such as the fees, main functionality, available integrations etc. Then, choose a few solutions that fit your needs. Check out the free trials of these apps, read online reviews, get explanations from the seller, and do your research thoroughly. This in-depth homework is sure to aid you find the best software application for your organization’s special requirements. How Much Does Luminate Online Cost? Luminate Online is priced on quote basis, meaning that each company receives a specifically tailored SMB/enterprise pricing package. Contact the company for more details, and ask for your quote. We realize that when you make a decision to buy Donor Management Software it’s important not only to see how experts evaluate it in their reviews, but also to find out if the real people and companies that buy it are actually satisfied with the product. That’s why we’ve created our behavior-based Customer Satisfaction Algorithm™ that gathers customer reviews, comments and Luminate Online reviews across a wide range of social media sites. The data is then presented in an easy to digest form showing how many people had positive and negative experience with Luminate Online. With that information at hand you should be equipped to make an informed buying decision that you won’t regret. What are Luminate Online pricing details? What integrations are available for Luminate Online? Luminate Online APIs provide ReST-style interfaces intended primarily for integrating Luminate Online content into other websites and creating custom web pages and forms. If you need more information about Luminate Online or you simply have a question let us know what you need and we’ll forward your request directly to the vendor.